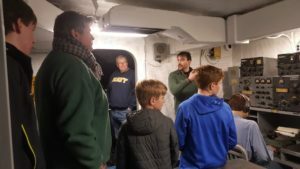 Your students will have the opportunity to take a class in one of several subject areas on board the New Jersey. Taught by certified teachers and meeting national and state curriculum standards, these classes allow children to experience first hand what they have learned in their text books. Our science/math classes are hands-on, encouraging students to experiment with the concepts they’ve learned, while our history/language arts classes involve handling artifacts and speaking to those who have experienced the era studied. For an additional $3 per student, minimum of 20 students, your visit On Board can include one or more educational classes. The Battleship New Jersey’s Education Outreach Program brings a piece of the ship’s history to your classroom. Students will be engaged and entertained while studying artifacts, primary source documents, and other hands-on activities. Teachers may choose from cross-curricular classes which encompass math, science, history, art, social studies, technology, and language arts and are aligned with state core curriculum standards. The cost of the 45 minute class is $125 for up to 35 students plus mileage if outside a fifty mile radius of the ship. Relive history through the eyes of the men and women who served this great nation. In this 90-minute program, your students will have the opportunity to conduct an exercise in oral history with a veteran of America’s military forces. A Power Point Presentation will be used for students to discover the rich history of the Battleship New Jersey. Through interpretation of artifacts and primary source documents, students will evaluate the effectiveness of the Battleship New Jersey in history. Students will interact with the presenters and one lucky student will get to dress in navy uniform! 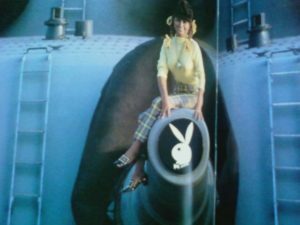 Short video clips of oral histories from those who served will enhance the educational experience, as well as clips of the battleship’s 16″ guns in action. Cost is $300 for a ninety minute session plus mileage if outside a fifty mile radius of the ship. 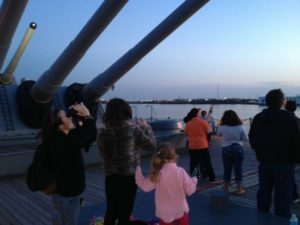 Through the advent of video conferencing, your students can “visit” the Battleship New Jersey while learning about topics which correlate to your curriculum. This interactive experience is supplemented by virtual reality demonstrations, oral history video clips, and artifacts which enhance the objectives of the lesson. The cost of this class is $125 ($80 if you are a member of the Garden State Distance Learning Consortium). World War II era canvass sea bags are filled with educational resources which can be utilized in your classroom. 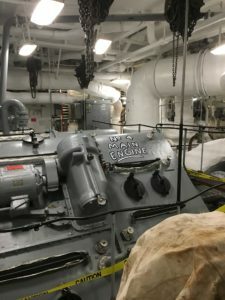 Artifacts, primary source documents, and lesson plans for a two-week period are at your disposal and are organized around specific topics in the battleship’s 60 year history. Teachers may both pick up and drop off the bag for a two-week period, or it may be shipped ground UPS for an additional fee. Bags include information on WWII, Korea/Cold War, Vietnam, and the Beirut Crisis. A $200 refundable deposit is required. The cost of the trunk is $75.